1.Long Rang: Effective distance Approx. 1/2mile (in ideal condition, range will diminish based on walls, floors, etc). 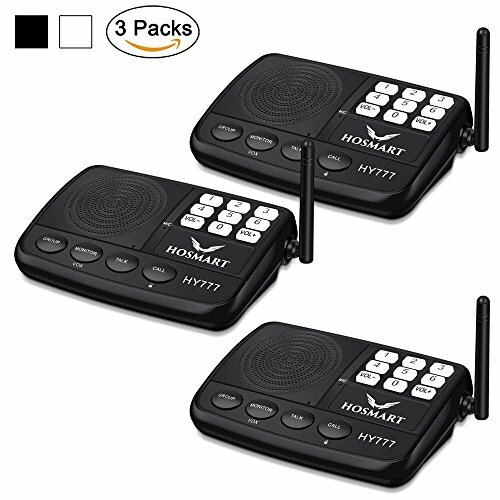 2.Multi-Channel (7 channel): 7 channels will be provide to you for calling family or office members, delivering announcements, or emergency calls. It can be choose one to one communication or one to all simultaneously. 3.Easy to set up and use, no installation requirement, you can take it to anywhere you want. 4.Monitor function continuously for 10 Hours at once . Three intercom stations included but you can expand to an unlimited additional intercom stations. 1.You can put the intercom to anywhere, bedroom, kitchen, baby room, living room, elder room, garage etc. 4.You can monitor the room as you want by using monitor (10 hours once time) or VOX function. 5.You can talk with two way radio if you change radio frequency to Intercom requirement. 1.You should set different channel code for different department and make a record. 2.You can make a private meeting with the specific people . 3.You can make a emergency notice or quickly meeting by the group call function. 4.Different department can make a communication freely. 1.This intercom can be charged by mobile power bank(5V 1A). 2.You can take intercom to anywhere, No WIFI requirement.